George hitchhiked west in the fall of 1966 to begin studying at University of Chicago. He relished his courses and top teaching professors. He read deeply, especially in poetry and philosophy. In a small seminar, he studied under Robert Pinsky, the future poet laureate of the United States. 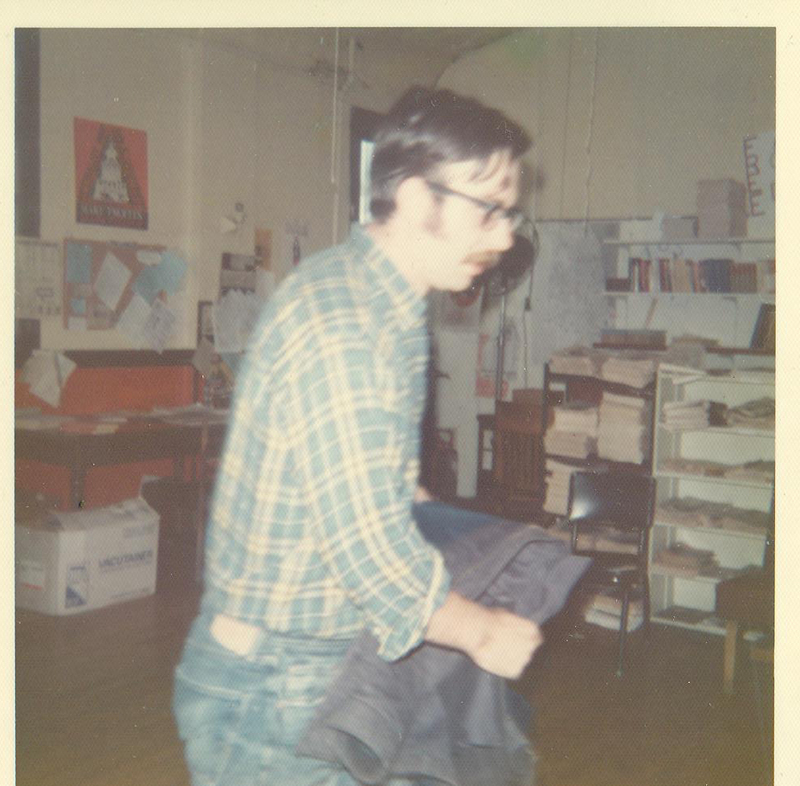 George Schmidt in the late 1960s in Chicago.As he did his whole life, George read voraciously in and outside of class. He never wanted the catechism, he told me, but the whole Bible. He wouldn’t just accept the words of Maoist gurus, he studied the original works of Marx and Lenin. During his years at the University of Chicago, George became a member of the Students for a Democratic Society (SDS), the leading campus activist group in the U.S. He participated in the demonstrations against the Democratic National Convention in Chicago in 1968. “I was on the streets every night except when I was locked up,” he said. In a piece about music George wrote for Labor Day, in 2011, he wrote about the convention. “Before his untimely death, Phil Ochs sang for all of us, and I can still remember him singing, along with Country Joe and the Fish and Peter Paul and Mary, when we marched, ran, shouted, and sang (and got tear gassed and some beaten) in August 1968, when that year crashed in front of the world (“The Whole World is Watching”) during the Democratic Convention in Chicago in August 1968,” George wrote. “In the years that followed the watershed event, I ran across thousands of people who said they had been on Chicago’s streets during those nasty (CS gas causes pain) and bloody (one friend of mine had his legs broken with billy clubs) days. Unlike many of the demonstrators at the convention, George had short hair and was hanging out with a cohort of short haired anti-war activists – all U.S. Marines who had just returned from Vietnam. Within two years after Maurice was killed in the war, George was an anti-war organizer, war resister and eventually a Conscientious Objector to the Vietnam War. In December 1968, George shocked his draft board in Elizabeth, New Jersey with his refusal to fight in Vietnam. He said they had never had a conscientious objector before. George said he would serve as a non-combatant, but the draft board wouldn’t put him in with his outspoken opinions and actions against the war, instead assigned him alternative service while granting his conscientious objector status. George always had to work to pay his bills, including while he was a student. His first job in Chicago was working in the medical records room at the Chicago Osteopathic Medical Center. He saw that some other SDS members seemed to have unlimited time “to debate issues and prolong meetings, and that students who had to work and maintain grades to keep their scholarships were effectively excluded from much of the formidable activism at the time,” he said. While a University of Chicago student, he also worked as a private security guard at Carson Pirie Scott and Co. at State and Madison and on a construction job. George obtained his degree from the University of Chicago in English and Humanities in the Spring of 1969. He did his professional training in education at Chicago State University and Northeastern Illinois University. By September 1969, he was working as a substitute teacher in Chicago’s public schools and working unpaid as a “military counselor” with the Chicago Area Military Project (CAMP). 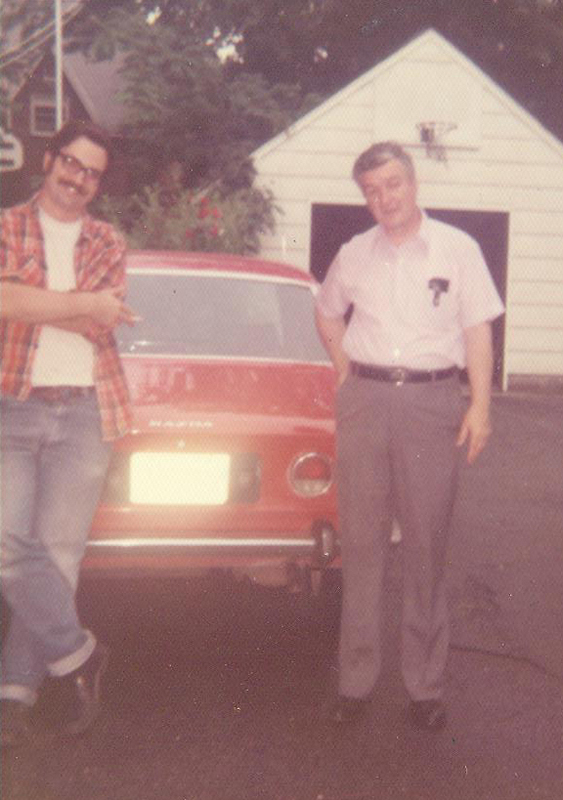 George with his father Neil during a one of his visits home to New Jersey in the early 1970s. For a few years, George juggled teaching – at Crispus Attucks, DuSable and Forestville Upper Grade Center – with his work in the GI Movement. He helped train active and AWOL soldiers to use the laws. He helped produce underground newspapers like Vietnam GI and Camp News, traveling around the U.S. to military bases, meeting with soldiers. When teaching became impossible with the movement work, George drove a cab to make money. He attended DePaul University of Law for two years, studying military law. After George’s death, I called Chris Burke at Salcedo Press to have the funeral service bulletin printed. Chris said he had known George since 1974 when he was in an anti-racism group called Sojourner Truth. The next day, when I called the office, a woman named Pat Gleeson got on the phone. She told me that she knew George from 1969.